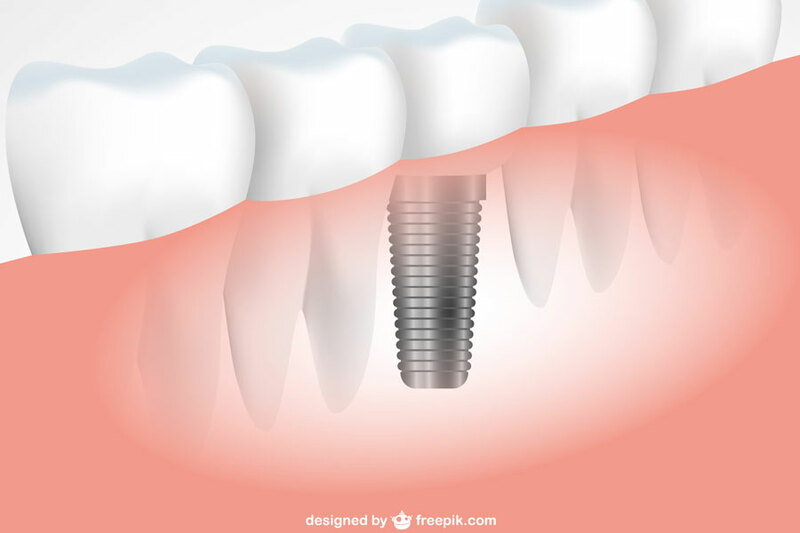 An implant is a titanium “root” which can be placed into the jawbone. Once integrated with your bone, the implant can be used to support a crown, a bridge, or secure a complete denture. Dental implants may be used to eliminate partial plates and dentures. First, the gum tissue is opened and the jawbone is tapped with a small drill and then drilled with a wider drill. The implant is inserted into place. The gum tissues are then closed and the healing phase begins. This may take anywhere from 3-6 months to ensure a strong base. Multiple tooth implants may be placed if you need or desire to permanently replace an extracted or lost tooth. Titanium implant bases are placed into the jawbone to replace the job of the tooth roots. We allow a period of time for the jawbone to heal over the bases before fitting for a crown. Next, abutments are screwed into the bases of the implants to allow crowns to be attached. Finally, custom fabricated crowns are placed over the abutments and will function like a real tooth. Full arch implants are dental implants that can be placed to accept a full arch of teeth. The arch is removable yet functions like a full set of normal teeth. Q: Are implants safe and how long do they last? A: Implants are a well –established, tried and tested treatment. Over 95% of modern implants last many years with the right after care. Q: I have some of my own teeth. Can I still have implants? A: Yes. You can have any number of teeth replaced with implants- from one single tooth to a complete set. Q: Can implants always be used to replace missing teeth? A: No. It depends on the condition, quality and amount of bone in your jaw. If there is inadequate quantity or poor quality of bone it may not be possible to place implants without grafting bone into the area first. A: Placing the implants requires a small operation. This is painless as it is carried out using local anesthesia but if you are nervous then sedation techniques can be used to relax and you will then remember nothing of the procedure. Following the placement of the implants you will experience some discomfort for about a week due to the normal healing process but this is easily controlled with the medication you will be given to take home. Q: How long does the treatment take? A: From the initial assessment to the time when the artificial teeth are attached can vary from the same day to, in very complicated cases, 18 months. You will be given a rough timetable before the treatment starts but, as a general guide, healing is faster in the lower jaw where bone quality is usually better than in the upper jaw. From commencement of treatment to placement of the definitive restoration is usually approximately 3 months in the lower jaw and 6 months in the upper jaw. Q: Why is this time necessary? A: The implants need time to bond (integrate) with the bone after they have been placed but in some situations it is possible to place provisional restorations immediately. These provisional restorations are for aesthetic reasons only and are designed not to carry any of the loads exerted during normal function. They are replaced with the definitive restorations when the implants are fully integrated. Q: If I lost my teeth due to gum disease, will I get the same problems with the implants? A: Yes, if you don’t care for them properly! Regular appointments with the hygienist for cleaning and a check on your home maintenance are essential if you are to have long lasting, successful implants. Q: Do I have an implant for every missing tooth? A: No, unless you’re having only a single tooth replaced, Normally. Five or six implants are used to replace all the teeth in one jaw and two or three for a few missing teeth. Q: What happens if the implant does not bond to the bone? A: This happens very rarely. If the implant becomes loose during the healing period it is easily removed and healing takes place in the normal way. Once the jaw has healed, another implant can be placed there. A: Yes it can be. You will be given a written estimate of the cost with a full explanation of the treatment and timings and alternative treatments and costing. Over the longer term, implants are usually a more cost effective and satisfactory option with many advantages. An implant to replace a single tooth avoids the need to cut down the teeth either side for crowns to support a bridge, and retains the bone needed for optimal aesthetics. Normal dentures often mean you can’t eat or speak well, due to the dentures moving about, but teeth attached to implants do not cause these problems as the implants are anchored to the bone even more firmly than natural teeth. Teeth Cleaning Hacks You Didn’t Know About! How to Clean Your Tongue!